The King of the Cage 135-pound Amateur Title was supposed to be on the line this Saturday night, April 19th, in Las Cruces as part of a solid “Throwdown” fight card. Due to unfortunate circumstances, Champion Robert Herrera was forced out of his highly anticipated re-match with the opponent who handed him his lone career defeat and in the place of a title fight, a number one contender bout was inserted to be the co-headlining feature bout of the evening. When El Paso’s Cristobal Chavez Davila (4-0) took the walk down to the cage over a year ago in March of 2013, few could have guessed as to where the two combatants would be today. Chavez-Davila and current KOTC Champion Robert Herrera met inside the cage in a bout that would mark both fighter’s second MMA bout. Herrera, who we all know today to be a human-highlight reel in his recent outings succumbed to his lone career defeat to Chavez-Davila on this particular night. While Herrera would go on to capture the promotion’s title and rattle off five consecutive victories, the victory by Chavez-Davila really put him on the regional map. 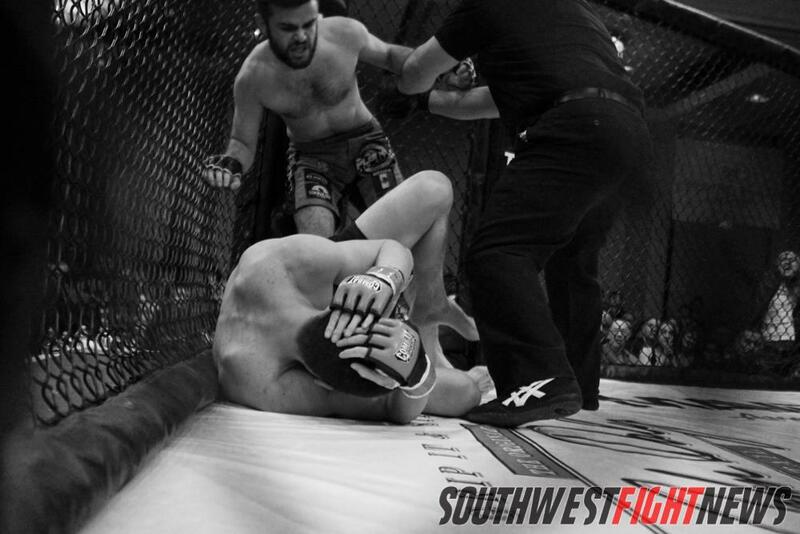 Following up with two more victories, the undefeated fighter out of El Paso is poised to make his own mark within the King of the Cage circuit. Chavez-Davila operates the 10th Planet Jiu Jitsu gym in El Paso, Texas and is currently a Purple Belt under Master Victor Davila and the famed Eddie Bravo. With four years of experience in Jiu Jitsu and Muay Thai, Chavez-Davila already possesses a healthy dosage of martial arts experience at 24-years old. In four career outings, Chavez-Davila has defeated four New Mexican opponents; aside from Farmington’s Herrera, he holds wins over Thomas Mills of the Perez Fighting Systems, Brent James, then of the J5’s MMA gym, and Josh Rodriguez in his MMA debut. The talented fighter from El Paso will find himself in a number one contender fight on Saturday night against Kevin Wirth, his first non-New Mexican opponent. Training out of Durango, Colorado and the Durango Martial Arts gym, Wirth has also met up with the Champion Herrera inside the cage losing a judge’s decision this past December in what was one of the best amateur fights arguably ever to happen in this region. Prior to the bout this weekend, Chavez-Davila shared some time with SWFight and offered his thoughts on several topics. 10th Planet Jiu Jitsu is the only system I have been a part of. I started from zero with Master Victor Davila. Therefore, I think I am a good example of a pure 10th Planet grappler. I think it is very effective in the sense that it is always evolving and growing. We have an open mind to whatever works in MMA, if it works.. we add it. Our system specializes in our back game and a clinching style. In my opinion all MMA fighters need to have a good back game because eventually you will end up on your back and if you do not know how to defend or get out you can get hurt or finished easy. Currently undefeated at 4-0, the El Paso trained Cristobal Chavez Davila is on track to fight for the King of the Cage title against the Champion Robert Herrera, a foe he has already defeated. It’s the ultimate challenge between two people. Physical strength, mental strength, spiritual strength, strategy, guts, luck, everything. Fighting changed my life, it makes you stronger in day-to-day activities and you stress less about everything. Well, of course it feels good. I am happy that after that fight he has gone on a winning streak. Unfortunately, I have not been able to fight as much as him because I do more grappling tournaments. So hopefully if I win this fight I will get to prove again to everyone I’m a better and smarter fighter. To what I remember, I came out with strikes and he clinched, I took him down and he reversed it. It was basically more wrestling to try to get the top position the whole round. It was pretty even but I would give him that round. Second round, same thing, I came out with strikes he took me down I closed a triangle, he tried slamming me and just got deeper in the triangle. He is a strong dude that throws people around, powers through people on the ground, he has a good base. It’s huge! I have never fought here and a lot of people haven’t been able to see me fight. I will fight my heart out to not disappoint. I have a lot of support and I can feel their energy. I feed off of the energy when i am in the cage. I will be 7 feet tall and 300 pounds in there. All other times I have fought, it has been in way higher altitude so I had to go days before to try and get accustomed, this time I won’t need to do that. I was preparing for a 5 round battle and now its 3 rounds. So all that energy I had for 5 rounds will all be compacted into 3 rounds. I was pretty upset I wasn’t going to fight for the belt but it just made me hungrier for it. I know for a fact this guy does not want it as much as I do. I feel like a lion when they would open the gate at the coliseum. Coincidently I always go in first so that’s what i feel, I’m just waiting for them to let my guy in. It’s a pretty indescribable feeling for me, I feel invincible and all eyes are on me. Like I said before I feed off all that energy. That is a wrap fight fans! Make arrangements to be in the building Saturday night, inside the Las Cruces Convention Center for King of the Cage “Throwdown”. Chavez-Davila and many others will be in action, showcasing their hard-work and martial arts talent for the enjoyment of the fight fans. Stay locked into SWFight for more King of the Cage coverage, bout breakdowns and analysis as we are only three days from MMA action in Las Cruces!